The definition, use, defense, and retirement of easements are areas of active work for land surveyors, lawyers, and the holders and buyers of easements, such as utility companies and highway departments. 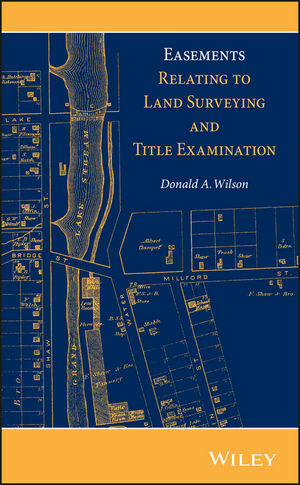 Easements Relating to Land Surveying and Title Examination is the most up-to-date reference that succinctly and incisively covers easements and reversions, written for land surveyors and title examiners. This comprehensive guide covers the various forms of easements, their creation, reversion, and termination. Its numerous case studies offer examples of situations in which easements resulted in litigation and reveal how these cases were decided by the courts. The book also includes coverage of undescribed easements and guidance on how to properly write new easement descriptions. DONALD A. WILSON is the President of Land & Boundary Consultants, Inc., in Newfields, New Hampshire.